April 19, 2017 (Ramallah, Occupied Palestine) — Today, more than one hundred sports associations, trade unions, human rights organizations and faith based groups, representing millions of people from 28 countries across the globe, joined football champions, scholars, film directors, politicians and government officials in calling on FIFA’s Council members to insist that Israel’s national football league revoke the affiliation of seven clubs based in illegal Israeli settlements on occupied Palestinian territory, or face suspension from FIFA. Signatories delivered their letter to FIFA Council members ahead of FIFA’s upcoming 67th Congress on May 10-11, 2017. They include former UN Special Rapporteur Richard Falk, former Brazilian Minister for Human Rights Paulo Sérgio Pinheiro, South African Communist Party Central Committee Member and Minister of Sports & Recreation Thulas Nxesi (signed in his personal capacity), renowned British filmmakers Ken Loach and Paul Laverty, former Peruvian football champion Juan Carlos Oblitas Saba and former athlete and President of Peru’s Congress Daniel Fernando Abugattás Majluf, and the Brazilian trade union CUT with over 7.4 million members. The letter criticizes FIFA for repeated delays and selective enforcement of its own rules, which prohibit any member federation from holding matches on the territory of another without the latter’s approval. The Israeli national league is clearly violating FIFA’s own rules by holding matches in occupied Palestinian Territory, against the wishes of the Palestinian federation. Scandalously, the Congress' agenda does not include the report from FIFA's own Monitoring Committee, which was established in 2015 to find a solution. Once more FIFA seems to be kicking the ball further down the road in an attempt to avoid action. The Palestinian Football Association has tabled its own motion. 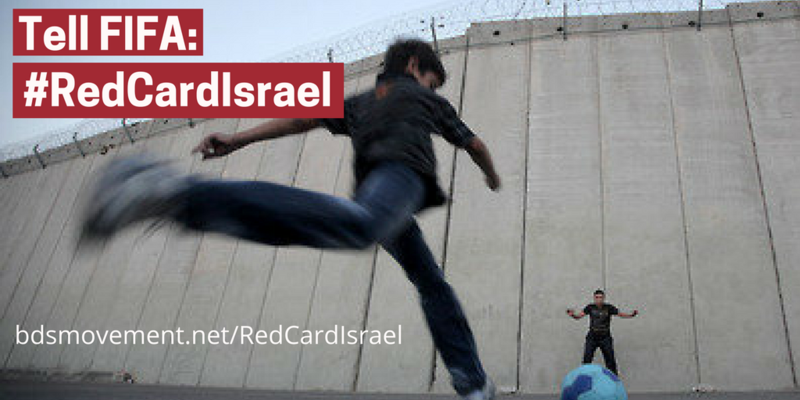 * FIFA is the governing body of international football, and civil society from around the world has since 2011 been calling on it to consistently apply its own rules and to heed international law with respect to Israel’s ongoing violations of Palestinian human rights. * In the last several months, the UN special adviser on sport for development and peace, 66 members of European Parliament, 30 members of Swiss Parliament, more than 40 members of Danish Parliament, 38 members of the British House of Commons as well as Human Rights Watch have all urged FIFA to resolve the issue of settlement clubs. * The letter’s signatories include the Italian Union of Sport for All (UISP), with 1.3 million members and more than 17,750 affiliated sports associations, Sport Against Violence in Iraq, organizers of the Baghdad Marathon, the Brazilian Landless Workers’ Movement representing over 1.5 million people in one of the largest social movements in Latin America, the UK charity War on Want and NGO platforms from France (40 organizations) and Norway (30 organizations). * The letter was endorsed by a number of faith based groups, including Pax Christi UK, Friends of Sabeel UK and North America, American Friends Service Committee, Lutherans for Justice in the Holy Land, United Church of Christ Palestine Israel Network, United Methodists for Kairos Response (UMKR), Episcopal Peace Fellowship Palestine Israel Network and Unitarian Universalists for Justice in the Middle East. * A number of Jewish groups have endorsed the letter, including Jewish Voice for Peace, with over 60 chapters in the United States, South African Jews for a Free Palestine, the Union of French Jews for Peace, Jews for Justice for Palestinians-UK, Sweden’s Jews for a Just Peace between Israel and Palestine and the Swiss-based Jewish Voice for Democracy and Justice in Israel/Palestine.